Type of automatic electric motorcycle seen have more and more enthusiasts. Practicality is presented makes it convenient owners. So do not be surprised if this motorcycle is now much sought after by consumers. More cheap operational costs are also the reason they are to buy electric motors. 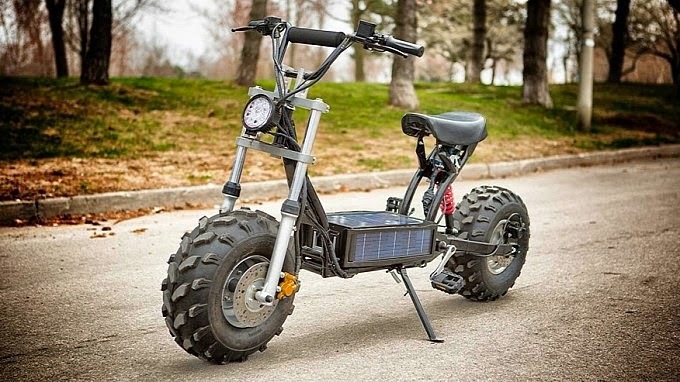 More recently Daymak, a Canadian motorcycle manufacturer were launching new solar-powered scooter products and named 'Beast'. With solar panels, reminding us of the vehicle in the early 80s or even earlier. 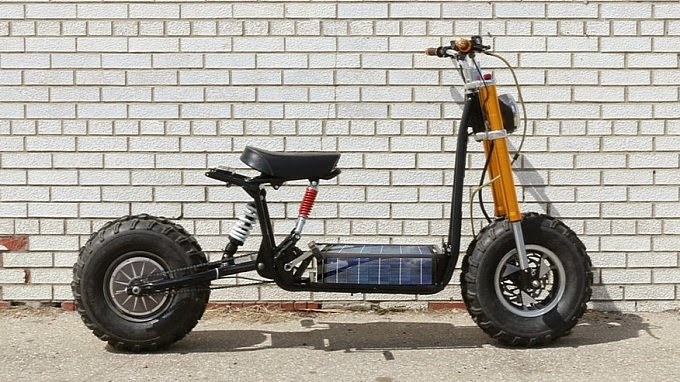 The concept, Daymak adding solar panels to the battery of their Beast scooter. Daymak Beast is offered in three variants, Standard, Deluxe and Ultimate with various engines, batteries and chargers. Daymak Beast Standard equipped with lead-acid 12Ah pack. As for the Deluxe variant filled with lithium batteries and Ultimate comes with a 20Ah battery. Daymak Beast mileage varies between 30 and 50 km. With a top speed of 25-32 kph (15-20 mph). The larger version is accompanied by a battery charger greater, then the charging time is only about 2 hours, compared to the 6 hours it took for the base model. One of the very coolest thing is that all the battery packs on Daymak Beast has 2 USB ports for recharging gadgets. All models of Daymak Beast are equipped with wider offroad tires. Ultimate models even have adjustable suspension for an offroad track. With disc brakes and lights, Daymak claim if the scooter is legal for public roads. Although there is no rear lights and turn signal lights. But Daymak is expected to complete it soon.